Why do certain desires manifest so quickly while others take such a long time? Why do most people have trouble manifesting the “big” stuff that matters to them — for example, large sums of money, relationships and physical objects such as cars and houses? Why do these manifestation techniques seem to work only for the small stuff in life but not for the “big” things? According to bestselling author and spiritual explorer Richard Dotts, the answer to these questions lie in the Manifestation Paradox. 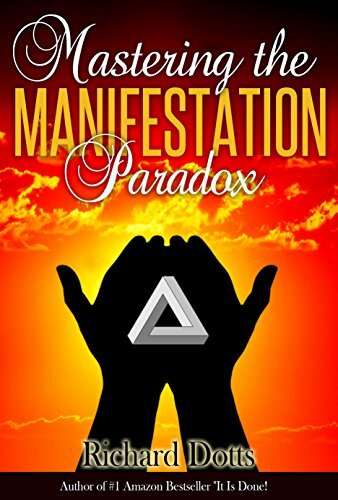 The Manifestation Paradox is an inner riddle that quickly becomes apparent to anyone who has been exposed to modern day Law of Attraction and manifestation teachings. It is an inner state that seems to be contradictory to the person practicing it, yet one that is associated with inevitably fast physical manifestations — that of wanting something and yet at the same time not wanting it. Most Law of Attraction and reality creation books teach parts of the manifestation paradox separately, but the reader is never shown how to resolve the seeming contradictions. As a result, most individuals do not realize the full significance of the Manifestation Paradox and thus never attempt to understand it fully. They try hard to make manifestations happen in their lives while holding on to contradictory vibrations and beliefs about their desires. Using his new paradigm of a manifestation scale and drawing from his own personal experiences, Richard explains why none of the physical obstacles which we perceive to be standing between our current selves and our desired manifestations actually matter to the Universe. The Universe always has the ways and means to deliver whatever we want in the fastest and most harmonious ways possible. Therefore, the only question that we have to answer is this: Are we in a receptive inner state to receive our good? Have we mastered the inner state that allows us to transcend the Manifestation Paradox? Join Richard Dotts as he takes the reader through an inner journey which starts off with exploring the Manifestation Paradox in greater detail, before guiding you step-by-step to work on actual intentions and desires from your own life. Pick any intention that you have been struggling with and re-frame it in terms of the Manifestation Paradox. A pattern will soon become apparent for you. If certain desires have not manifested for you until now and you find yourself struggling with deep feelings of worry and desperation, Mastering the Manifestation Paradox will allow you to view all of your manifestations in a completely new light.